So many of you ask questions and want help planning your Bali Itineraries. Although we have lot’s of information on the blog, we wanted to give you an experience of a customised and personal itinerary with much more detail, so you can have your best experience of Bali. That’s why we created our Bali Itinerary Guides. Our vision for these Bali itinerary Guides is to give you the value of a one on one itinerary planning service, but without taking hours of your time to go back and forth with suggestions, without the cost that comes with a one on one service, and most importantly, its something you can get and use immediately. With these Bali itineraries, you can have the best experience of Bali. Almost Landing Bali was founded by Mandy and Chris in 2013 out of a love for Bali. Their Bali travel tips have been featured in The Huffington Post, Hotel Club, CheapFlights, DUO Magazine and the Bali Advertiser. Our One Week Bali Itineraries include two in-depth one-week itineraries and one bonus Jimbaran 4 day Itinerary, each with daily morning, evening and afternoon suggestions of what to do and where to eat. You will also get an array of checklists to help you plan your Bali trip and much more (see below). Rather than packaging each itinerary separately, we wanted to group them together so you can easily customise an itinerary of your own from the information we give you, or you can simply follow any one of our itineraries. Two complete versions of a Bali One Week Itinerary. Itinerary One includes Ubud + Seminyak, whilst Itinerary Two includes Canggu + Uluwatu. Each Itinerary includes a day-by-day itinerary, sectioned into the morning, afternoon and evening, including options for where to eat and things to see and do. Format: Interactive PDF – download your Bali Itinerary guides to your device or print it out. On your device, there are fillable fields and website links you can click. 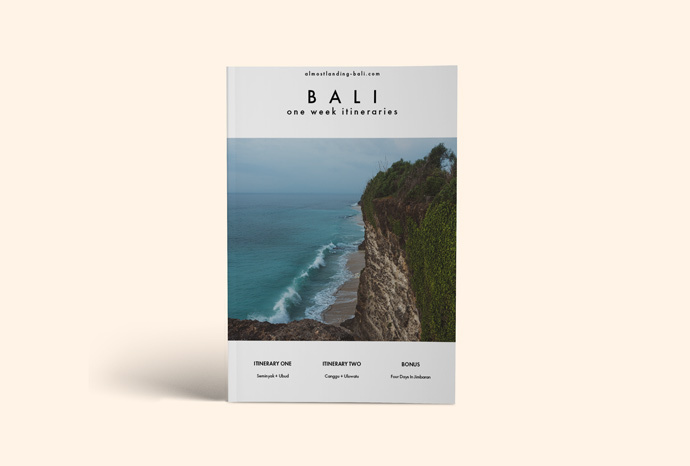 If you would rather plan your itinerary yourself, but want some insider tips on the best places to eat and things to see and do, all pinpointed on our own destination maps, take a look at our Bali field guides.